I was surprised to receive an email saying a prescribed burn was being planned for the woodland south of Woodger Place, Fraser. The email was a sign that a genuine pattern of information and consultation had been activated but the surprise stemmed from the fact that this area between Woodger, Bingley and Wickens had been burned in 2013. 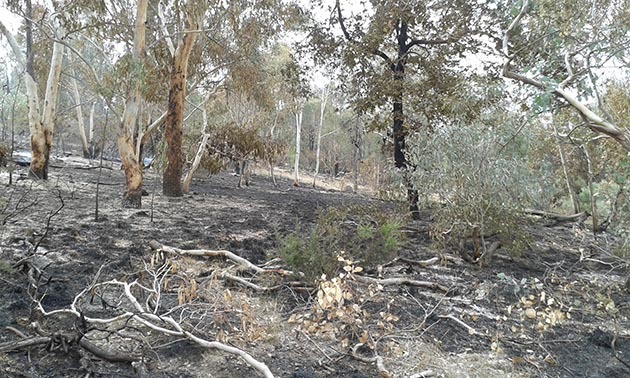 An on-site meeting was set up and I met with Claire Beale the ecologist who had informed the April 2018 Prescribed Burn in the section nearer the Flynn playground, Andrew Halley from the Fire Management Unit, Allan McLean from TCCS and Justin from ACT Parks and Conservation Service. The site visit showed a build-up of Fuel Load that would make “asset protection” difficult were a fire to move up the slope into the woodland from Bingley Crescent or the Wickens Place entry road to the main carpark according to Andrew. There’s a cluster of planted Grevillea shrubs that’s a hazard, there’s a wattle monoculture near the bus stop and a tall wattle near one of the power lines that has obviously been missed by ACTEW’s checking crews. 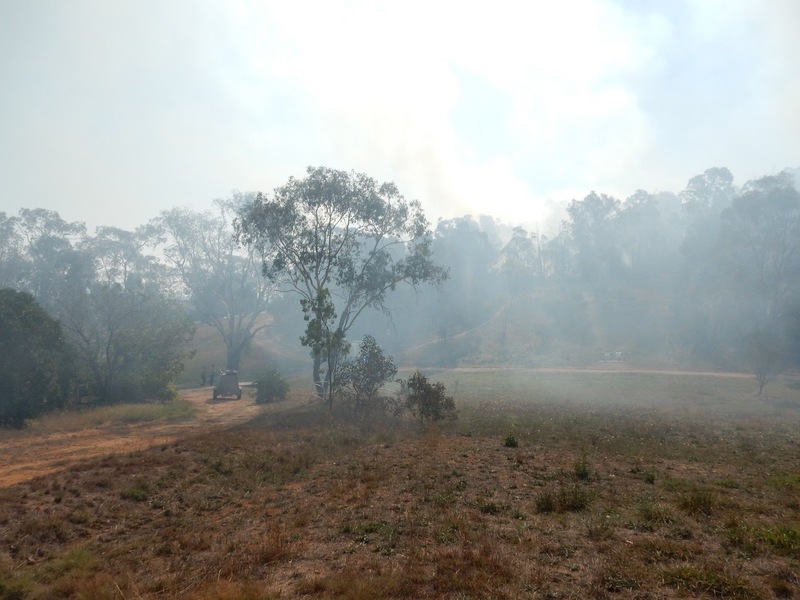 For the Landcare Group the most obvious fire hazard is that the woodland and the native grassland that surrounds it is almost surrounded with unmown African Lovegrass. Pre-burn preparation has been happening today. (I’m returning to my earlier effort). 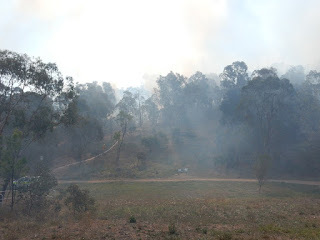 During the visit Andrew said no burn would be carried out until there had been at least 100ml of rain. 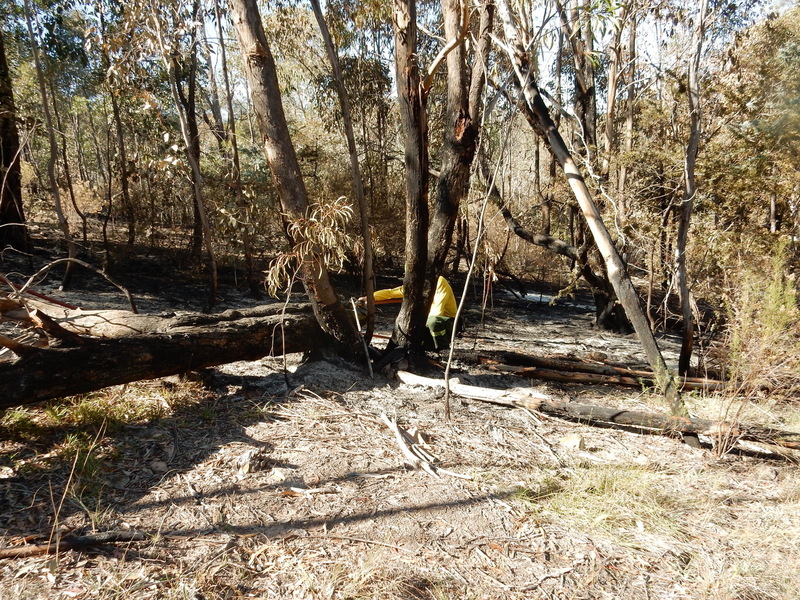 It will also be a cool, patchy burn as was the February 2013 burn. So far today 18.03.19, we’ve had 15ml in Flynn. You’ll know from previous newsletters that this grassy woodland area is the most biodiverse part of Mt Rogers. It has a delightful array of wildflowers in ‘good’ seasons. There’s one rare species present and it’s extending its range after the previous burn’s heat split opened seeds that had dispersed from the original parent plant. Superb Parrots visit the trees and the “ooming”, uncommon Common Bronzewing Pigeon thrives on shelter amongst the shrubs. 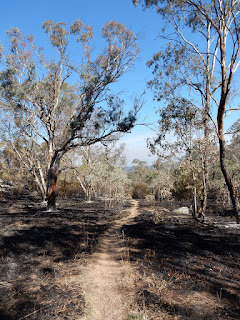 My question remains will a new burn just 6 years after the previous prescribed burn adversely affect the leaf-litter invertebrate species and native plants that make this place so special? I went up to Mt Rogers after 09.30 today and quite a bit of clearing work had already been done near the Woodger fenceline. The crew’s leader walked round the site with me and I showed him the plants that need special protection. I met Allan McLean, the TCCS Urban Open Space Volunteer Co-ordinator, at the on-site meeting last week. He has reported the dump of builders rubbish behind Woodger Place again for us. He’s also organised for some NO DUMPING signs for us to erect for Mt Rogers. Irnoically as this was being organised Chris reported a new dumping near the gate. It’s concrete and builders’ plastic. I showed Allan the hazardous state of the footpath near the Flynn playground. As you know, this problem has been reported to TCCS several times before. I also mentioned that Mt Rogers has needed ‘dog-behaviour’ signs about its being an OFF LEASH area and cleaning-up pooch’s poo is required by law. Echidnas are special and several reports of sightings have come in from Mt Rogers in recent weeks. Sightings of echidnas and other interesting species can be sent to Canberra Nature Map. This volunteer-initiated and run system collects data about flora and fauna in the best tradition of both citizen and professional science. If the distribution and abundance of species is known there is greater understanding of exactly what constitutes the ACT’s “estate” and what defines the nature of our region. Volunteer landcaring in all its forms is so vital to the health of the bush capital and the plant and animal communities you work for! At our last Sunday working-bee Julie and Neil helped Ivan, Phil, Ted and me continue our efforts against Honeysuckle and Tree of Heaven whilst learning the cut and daub technique. On Monday 4th March Angharad, Ted and I returned to the eastern side of the reserve finding more Euphorbia plants, Chinese Pistachio and Briar Roses that needed a further ‘attack’ and visiting another Honeysuckle patch. “Touch-wood” the Honeysuckle there was limited to just a few resprouting shoots. Lush growth of the native Weeping Grass Microlaena stipoides made the site under an ancient gum tree look really natural. Did you see an article in The Chronicle a couple of weeks ago featuring local bats? They are such important pollinators yet we’re often unaware of their presence because they are nocturnal. I’m sure there are plenty of bats using the habitat tree-hollows on Mt Rogers. They’re probably pollinating your fruit trees…though no doubt eat some of the fruit later in each year. We have two dead Fruit Bats on the phone wires at the end of the next street. With their broad wingspan I could understand the bats touching two electricity cables simultaneously but their being on the phone lines is a mystery. Sometimes I muse about the presence of the cables through many suburbs and beyond. Yesterday I saw 4 Sacred Kingfishers watching for movement on the ground from wires in Macgregor. Many birds use the cables above our garden. I think everyday bird watching would be much more challenging if the wires weren’t there. I reckon the wires spoil our views across the landscape at times but until electricity supply is decentralised I suppose we have to train our brains to air-brush wires from the views we’re enjoying! The dates for the next two Working Bees are Sunday 24th March & Monday 1st April. They will begin at 09.00am and be seeking out berries’ colour and the autumn leaves of deciduous plants that aren’t native to Australia. Please meet at the Wickens Place carpark. We’ll provide tools, gloves if you’ll wear clothes for the expected weather and bring water to drink and enthusiasm! Snakes Alive! is on again this January, very soon, at the Botanic Gardens as usual. Here are the details, from the ACTHA webpage. Snakes, Lizards, Frogs, Turtles, Crocodiles! with feeding times at 11am, 1pm and 2pm daily. It is at the Crosbie Morrison Building, near the cafe. The building is air conditioned, perfect for escaping those hot summer days! You may see species local to the ACT and Southern Tablelands region, such as the highly endangered Northern Corroboree Frog (Pseudophryne corroboree) and threatened species such as the Grassland Earless Dragon (Tympanocryptis pinguicolla) and Striped Legless Lizard (Delma impar). On Sunday 26th August we’ll meet for a Working Bee at Mildenhall Place, Fraser, from 09.30. On Monday 3rd we’ll meet at the Wickens Place, Fraser carpark at 09.00am. Sometimes spring’s here and then another front comes through and blows away the illusion. BIRDS: For those of you who go across country be aware that there are over a dozen magpies keen to investigate anyone walking through the reserve on the way to the summit. The magpies might seem to swoop but are flying in closely, checking to see if you’ve brought food. Someone has been feeding magpies, so the flock has become opportunistic. Some species of birds are definitely in the pre-nesting phase with predawn carolling from the local magpies. Cuckoos have been photographed around the region … they don’t have the “cuckoo” call but do trick other species into incubating their eggs & raising their chicks. Perhaps someone will be lucky and find a roosting pair of Frogmouths before they begin building their cryptic nests. This afternoon a Thornbill was bathing in a puddle on the track to the twin reservoirs. As you’d realise this puddle was a very unusual sight in the drought situation. There was a flock of small birds flying between taller trees. Amongst them was a Grey Shrike Thrush and possibly a Whistler. 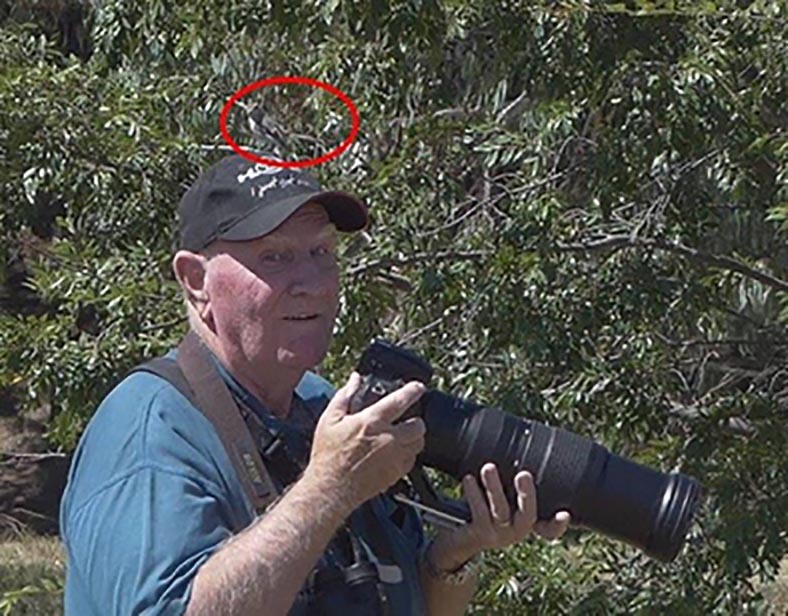 Reports of Boobooks calling came through on the Canberra Ornithologists’ email-line on August 5th. There was also a report from Angharad in Fraser to the Mt Rogers email list. to ask if the Boobook would be useful for the collection. The answer was “Yes please”, so a few days later they took the bird out to the collection. It followed the route-to-science that Hayward and Ruth’s young Koel followed from Mt Rogers earlier in 2018. Please remember that if you approach injured animals, use CAUTION. Wear gloves when handling dead animals. To report injured wildlife (including its exact location and whether it’s dead or alive), call Access Canberra (phone 13 22 81). Or you can call ACT Wildlife (phone 0432 300 033) for any injured wildlife, excluding kangaroos and snakes. PLANTS: Steve’s been digging out Serrated Tussock plants, with a pair of Scarlet Robins as a rewarding visitor to their garden. Between his and my efforts this week, 200+ plants have 'hit the dust'. The honeysuckle debris we pulled from three sites has been taken away by a TCCS crew. We still have to dig out the plants’ main roots and there are at least two more patches to work on. Ivy is proving more of a problem because each branch takes root when it touches down on soil of on a hapless tree’s trunk. 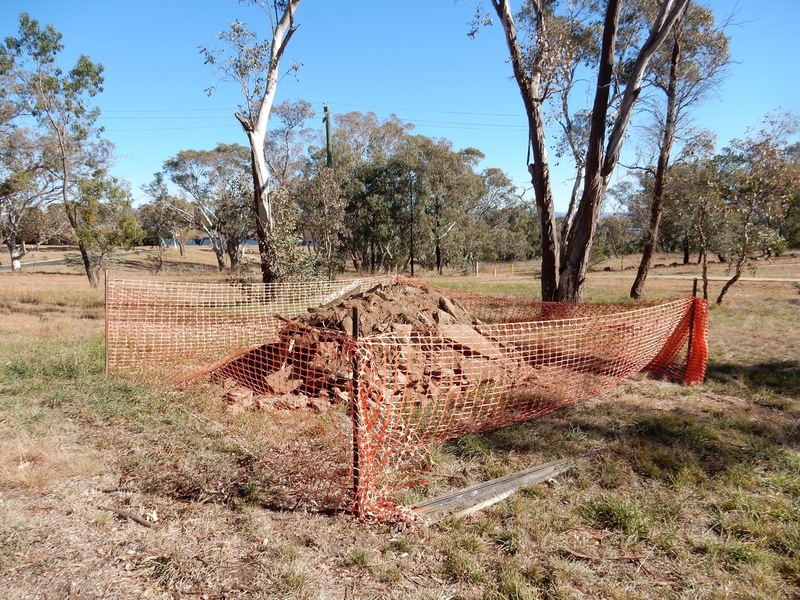 We, like the Umbagong Landcare Group at Latham, intend to notify TCCS of these infestations. Some of the north-facing leaves of an ivy on the big Banksia looked as though they’d been frosted. Some Hardenbergia bushes were rusty brown. Hopefully this was a reddish-brown reaction to the frosty nights and not dead leaves. The creamy-flowered Early Wattles near the main carpark are almost past their flowering prime but Cootamundra Wattles will take over. Hopefully there will be some insects in the Cootamundras to feed insectivorous birds. ECHIDNAS: at least two people have reported seeing Echidnas on Mt Rogers. FUN: Look at this cubby, built on a fallen 'dinosaur-lookalike' trunk (photos before and after). See you “on the hill”, soon. The weekend’s bitterly cold wind was still obvious but didn’t deter the 20 or so walkers who shared the path and conditions from 13.15 onwards. I met an energetic multi-lap runner who joked “Not having a stall today?” This with reference to my gathering up some brochures for a make-shift offering of local places-to-visit and natural history information on the Queen’s Birthday holiday. She’d signed the Ginninderra Falls petition then. 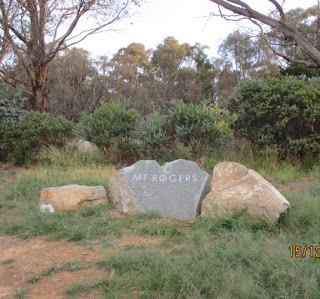 This reminds me to thank all Mt Rogers community members who have signed, petitioning MLAs to ensure that there are ecologically sound buffer zones around Ginninderra Falls to protect the unique area from the encroachment of urban development in the future. The Ginninderra Falls Association has heard that there may not be any news of the NSW Government’s deliberations about approving or rejecting Riverview’s rezoning application until next year. It’s vital to have the hundreds of signatures gathered so the community is ready for the developers’ next moves. Wild oats, germinated and flourishing green amongst the thicket of Cootamundra wattles, were almost the only sign of lushness in the prolonged dry conditions we’re experiencing. 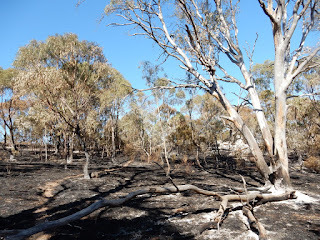 The thicket’s there because that area was set fire to some years ago and wattle seeds need heat to split the seed coat, to allow water in and to stimulate germination. Some Thornbills were calling high in the nearby eucalypts as they sought insects. 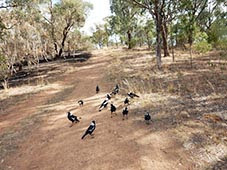 Currawongs’ calls resounded through the reserve. Are their seemingly omnipresent numbers reducing small, insectivorous birds’ chances of survival, breeding and keeping the insect populations in shrubs and trees balanced? The pile of concrete-from-the paths debris Mt Rogers needlessly hosted has gone. Soil, straw and seeds are evidence of restoration attempts. Time will tell whether there were weed seeds in the soil and whether ants and birds ate too many of the seeds. Chris D kept me informed of the debris progress. Chris and Rob have had issues with the path workers’ accessing their street. Debris dumped in the reserve when there's an exit gate 50 m to the left. 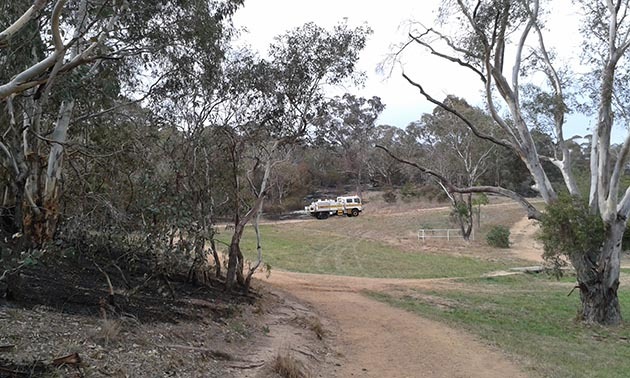 The heavy vehicles’ track from the Magrath Place gate through the reserve’s grass is very obvious. Less obvious were up to 50 young Serrated Tussock tussocks near the ‘white house’ and the Mildenhall Playground. As several of the seat notices were going mouldy and the masking tape was finally succumbing to the elements I’ve taken the notices down for now. I’ve asked rachel.tokley@act.gov.au if she can seek permission for our using cable-ties to attach the A3 info sheets to the seats. Chris C trialled that method for us. There were one or two Puff-balls along the track. These remarkable fungal fruiting bodies push their way through the soil, gravel and sometimes even urban asphalt so the minute spores can be exposed to dispersal by breezes. The spores are part of the mix of fresh air we breathe and that most of our bodies learn to cope with. I wonder if Mt Rogers hosts Truffles? They are an essential part of the diet of Australia’s small digging mammals. The diggers, just by foraging for their food, created holes through the soil allowing air and rain to penetrate. Plant debris entering these spaces added nutrient-rich, decaying material that retained water and created diverse soil structure. Introduced animals have caused the extinctions of hundreds of small mammal species with Australian soils impoverished as a result. Search for Mulligans Flat fences and check the Australian Wildlife Conservancy’s site: http://www.australianwildlife.org/field-programs/feral-cats-and-foxes.aspx for up-to-date projects that include fencing introduced predators out of reserves. 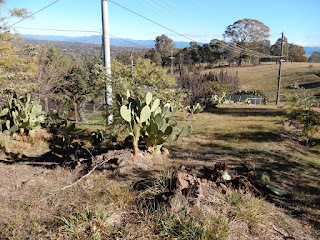 I took some photos of the Prickly Pear cactus ‘plantation’ above Bainton Crescent, Melba. 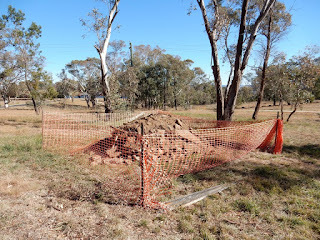 Quite soon after the 2003 fires I came across the householder removing smaller rocks from beyond his fence-line. He was piling them up in heaps on the edge of the main rocky knoll there. When I remarked “that’s a lot of work” the reply was that he was clearing the rocks away so the grass could be mown to protect his property. “What about the cactus plants?” I then asked. He said he’d put them in in the seventies to prevent burglars from entering. Now we can see further results of his labours. The Prickly Pear pieces he planted into the rock piles have grown into substantial specimens. Pieces turn up in the rest of Mt Rogers from time to time and neighbouring Bainton properties have a few as part of their hedges. What would happen if each piece were put through a mulcher? Would the pulp be any use or would it grow? The last three working bees have seen Angharad, Anne, Ivan, Jemima, Phil, Ted adding to our CV’s by tackling three separate expanses of Honeysuckle. It’s cosmetic weeding to a certain extent as the sources of each intertwined plant will regrow. By then we’ll be ready to spray the new leaves or return to dig out the roots. More intractable are several Ivy infestations as the trailing branches have roots that’ll cling to trunks or grow wherever they touch ground. Ivy berries are cryptically dark bluey-black but the birds bring them from gardens and poo them into the reserve when they perch on trees’ branches. Ted, Phil and Angharad beginning work on Monday 2 July. We were watched, most of the time, by a Galah perched above in the next tree. Was it guarding a nest hollow? Jemima was also in the team. Phil, Ted and Anne in action. If your walking or cycling takes you near Canberra region creeks, lakes and rivers your help with a new project would be more than welcome. The Australian Platypus Conservancy is organising surveys of the presence and abundance of the Australian Water Rat Hydromys chrysogaster. (If that name is daunting divide it into four! water+mouse+yellow+belly explains what the scientific name reveals) There will be gatherings where the project and the animals’ lives are explained. One is at ANU on Thursday 2 August at 19.00 hrs and another is being organised by Waterwatch at the ‘Old Health Centre’ Kippax on Wednesday 1 August also at 19.00hrs. (Parking behind Woolworths). 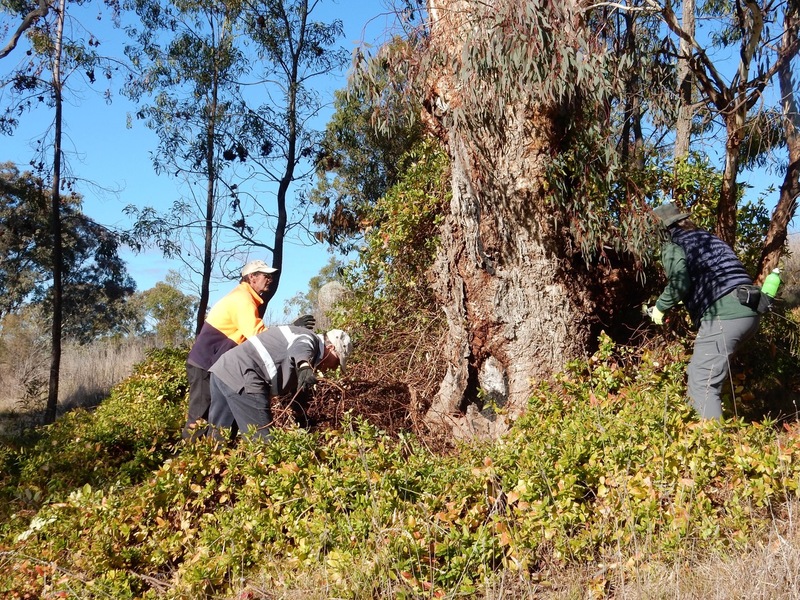 Our next Working Bee is scheduled for Sunday 22 July. Potentially frosty nights & mornings suggest another 09.30 hrs meeting time. Meeting above the easement between Hammett and Bainton Places on the reserve’s Spence - Melba edge. Rosemary, Mt Rogers Landcare Group 6258 4724. The team is lead by Brian Bathgate, Operations Manager Belconnen/Gungahlin. We’ve been volunteering successfully with Brian as Mt Rogers’ Land Manager for many years. Both he and Rachel understand our passion for Mt Rogers as a nature reserve and they appreciate the consistent stewardship – custodianship contributions our community makes. The section of track nearest the Flynn Playground is the one being referred to. Its need of urgent maintenance has been consistently reported. And as recently as yesterday after another worrying trip and fall by a regular walker. or Crime Stoppers 1800 333 000 when negative activities are happening. 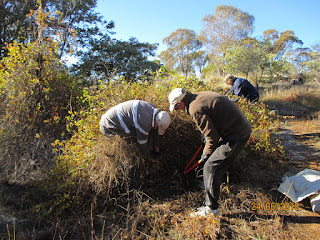 Ted, Claire and I tackled some woody weeds on the edges of the burnt area on Monday7th. On Sunday 27th May we’ll work on more on the NE section. Meeting near the Tudor-Style House-seat from 09.30am. 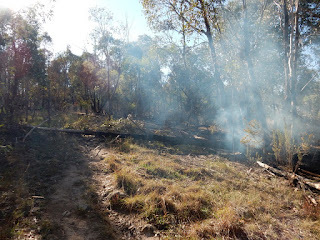 The distraught reports from Mt Rogers' carers of tree felling, branches cut and ancient eucalypts marked with striped or yellow tape was an inauspicious beginning to the Hazard Reduction Burn (HRB) of Saturday 21st April. We hadn’t expected “to be the last to know” because protocols regarding informing communities improved dramatically after the eastern section of Mt Rogers was the site of the reserve’s first HRB in August 2011. Several weeks later Prescribed Burns signs went up, letter-boxed notices were delivered to the nearest properties and I received an emailed notification through Rachel Tokley. Visible preparations began on Friday 20th April. Fire Management Unit personnel installed sprinklers up-track from the Notice Box and all round the HRB’s borders so the extent of the blaze would be contained. Ancient and significant trees were hosed down or sprinkled to ensure their damp bark was able to repel the spread of fire up their trunks. On the day, Andrew (Dir. Comm.) confirmed locations with me in order to protect the Blue Grass lily clumps, our plantings and the prickly Hakeas that serve as refuges for small birds. It was clear from conversations with the Fire Management Unit’s Andrew and Tom that our electronic mapping of rarer plants and Mt Rogers’ sensitive areas, with Ginninderra Catchment Group’s assistance by contacting the research unit, had been effective. Clare Beale had remapped and GPS’ed significant areas on March 7th during our introductory ‘walk round’ with Rachel Tokley. Whenever I met the actual fire crews during or after the burn it was clear that they each had in-depth ecological understanding, knowledge of individual species’ characteristics and responses to fire. They treated Mt Rogers with respect and care whilst carrying out their tasks and burning what we have loved for decades. View of the burn from Flynn playground. 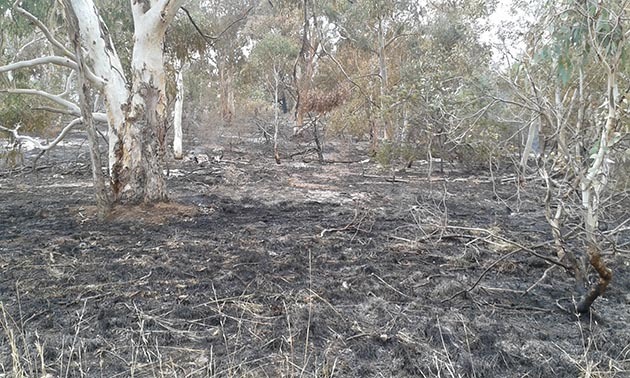 Even though they may have begun their fire-fighting careers seeing “the bush” as the enemy the fire-fighters now apply their training to achieve the patchy and cool burns that give native species the maximum chance of natural and robust recovery. 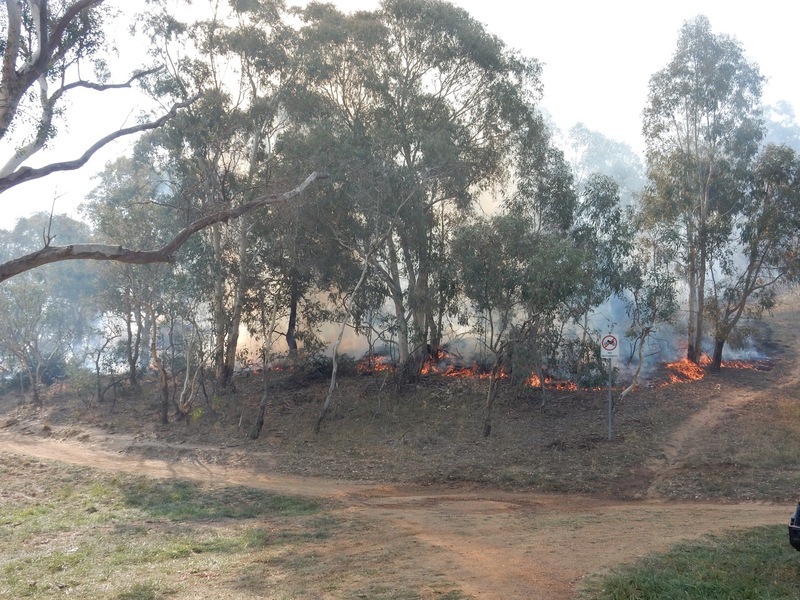 There were at least six units, including Hall’s Volunteer Rural Fire Brigade’s Unit 10, present on 21st. Each crew was allotted a section of the reserve for specialist lighting and managing the fires with their tankers, equipment and hoses along and down from the mostly northern boundaries. As it was a calm day the smoke tended to ascend rather than drift down the slopes towards Flynn. There were exceptions, with no-one being exempt from being affected by swirling greyness quite regularly. Quite soon after seeing the first smoke from near Schwarz Place, several of us saw a raptor soaring above the smoke. Neither my attempts to photograph the bird nor the other observers were able to establish its identity. Black Kites are known to respond rapidly to seeing smoke, knowing that there will be fleeing animals to be snatched up in their talons. But Black Kites aren’t common in this region. Currawongs didn’t miss the opportunities of multiple roasted invertebrate ‘dinners’, calling and coming in soon after the areas had cooled. Magpies were more demure about their foraging. Today, eleven days afterwards there were 15 Crimson Rosellas amongst the 5-Ways Snow Gums, busily picking up or taking the eucalypts’ small gumnuts off branches. Were they eating the minute seeds? During my several visits since the HRB there has been great stillness in the burnt area. Sometimes small groups of birds will be in the trees’ shocked canopies with some of these being migrating Honeyeaters. A Kookaburra struck a characteristic pose above the grey, white and black ground. 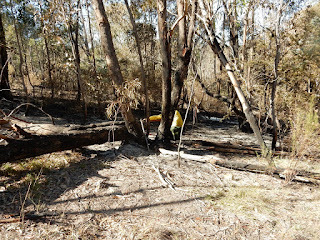 The huge eucalypt where I watched kookaburras attempting to enlarge a hole into a nesting hollow two springs ago lost a main branch 36 hours after the burn. It may have received a too-hot burn. Jill phoned to report a tree fallen across the Lily Track (up past the No Motorbikes sign off Schwarz Place). The remains of the multi-trunked tree still smouldered actively. This was in turn reported to Tony who alerted the crew charged with being on-site on Tuesday 24th. The post-fire crews also had tankers, hoses and equipment. They, like their on-the-day colleagues were brilliant at engaging with ‘the public’, reassuringly explaining processes, principles and the needs of flora and fauna and our species. They were glad to have our directions to hot spots and appreciated that, if we had taken the risk of entering the burnt zone, at least we were each well prepared and wisely shod. Several young children had the joy of feeling the power of hosed water when they came up “to see the fire-trucks” during the Parks crews’ lunchbreak. 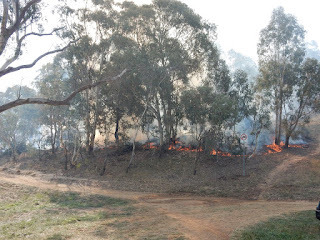 Some adults had driven several kilometres to “see where the smoke was coming from”. I received comments like “It looks much better”, “When are they going to do the rest?”, “They’ve done a good job”. Sometimes I’m not quite sure how to take these … do those beyond our knowledgeable community want the bush to look neat and tidy in a parkland sense (as around the Flynn playground perhaps)? 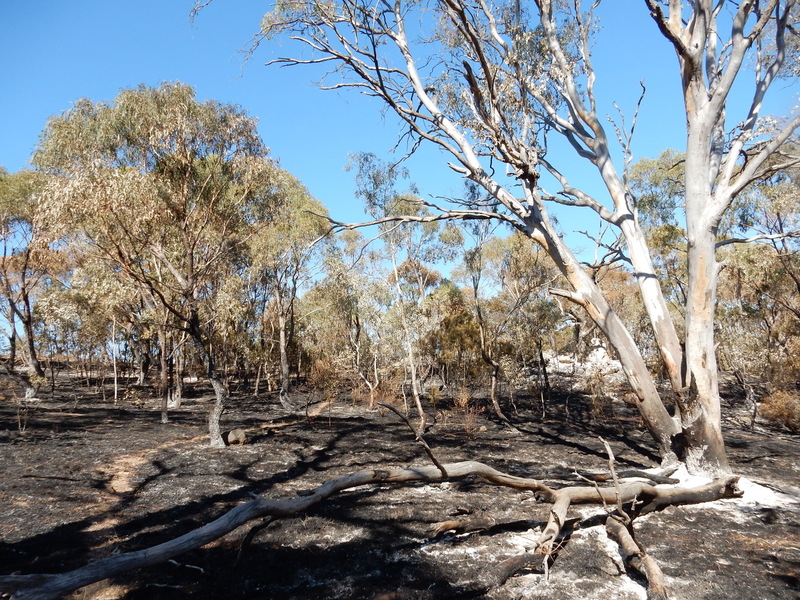 Many haven’t had time to join the dots … if all is burnt at once where do the mobile species go, live or forage? If black, white and grey homogeneity is a “good job”, do people see shrubs and grass tussocks as an impediment? Perhaps far more people than we realise are terrified of the dangers posed by “the bush” as they understand it. Even during the HRB there were butterflies flying around. Perhaps they were hill-topping. The commonest butterfly at the moment seems to be the Meadow Argus with circular spots on its wings. Small beige moths were there today. Perhaps they sought the bases of grass tussocks for egg-laying? Some of the burnt tussocks showed green growth already. In a couple of places where sods of soil had been dug up during the preparations, Wild Oats seedlings have emerged. Weed species responding to “disturbance”. Perhaps that principle is the basis for no-dig gardens and minimal-tillage farming? I recognised a few Pasture Day Moths on the Saturday. Apina callisto is a day-flying species. You’ve seen the plump caterpillars moving over the gravel path in the winter looking for places to dig a pencil-diameter tunnel into the hard surface. They pupate in these tunnels, emerging the following April as we’re now seeing. The caterpillars feed in the frostiness of winter but survive because of the antifreeze agents in their cells. I did wonder how much “smoke inhalation” birds, dogs and other species can safely breathe. Their respiratory systems are often very different from the lungs we take for granted. We had 7 mL rain on Sunday 29th here in Flynn. How much did the burnt area receive? The rain drops don’t seem to have washed the ash away or caused the bare soil to move. The kangaroos’ tracks through the bush are very clear now. Phil’s going to monitor any erosion effects on the tracks he already cares for. If you have any photos of the HRB and the healing that will happen they’d be a most welcome record of how this section recovers. It’s the most extensive moderate-to-good biodiverse area of Mt Rogers, even though there are places where the rank introduced grasses over-dominate. Would you consider taking a series of ‘after’ photographs of an area that you regularly pass by? We can put them up on this blog. 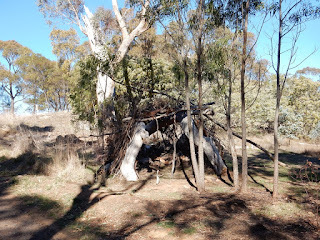 For Monday 7th’s working bee I propose a walk around the outer edges of the HRB area with wands and loppers at the ready. A few privets, Celtis and other woody weeds are showing themselves. We'll meet near the Notice Box at 9.00 am. Rosemary, Convenor, Mt Rogers Landcare Group. 02.05.18. 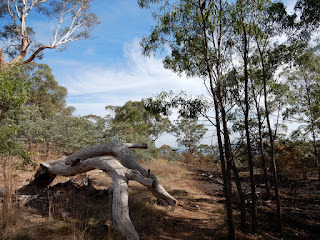 March came in with a rush of activity when there were several reports of ground being cleared, branches sawn off trees, trees cut down and several of ‘our’ most treasured, centuries old Eucalypts having ribbons round their trunks. It took Brian Bathgate, Mt Rogers’ Land Manager for TCCS, an hour or two to find out what was happening. The Fire Management Unit had begun preparations for a Hazard Reduction Burn (HRB) in the reserve without alerting the Land Managers, much less the reserve’s community. There is a Brett McNamara article in this week’s Chronicle on page 7. It does not seem to explain what HRBs in our reserves are designed to achieve other than “to enhance, protect and conserve our beautiful bush capital”. There was a HRB on the eastern side of Mt Rogers in August 2011. The currently planned burn is part of the broad ACT-wide schedule of HRBs. I put a map of the target area on the seat by the notice box. 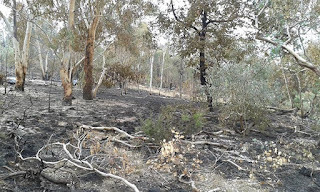 It shows that the burn will affect the vegetation between the track up from Jacob Place (Flynn) and the rocky track up from the notice box. I placed some Living with Fire brochures in the notice box and in residents’ letterboxes in adjacent streets. Rachel Tokley is Urban Volunteer Group Co-ordinator for TCCS. On Wednesday 7 March Rachel visited Mt Rogers for the first time and heard about our concerns. More importantly, she was really impressed with the place, the sense of community that we have and what we have achieved with your decades-long landcaring, erosion management, stewardship and species observations. Since she has an extensive network of contacts within and beyond the ACT Government’s agencies, Rachel encourages us to report management issues to her, rachel.tokley@act.gov.au and ph. 0478 404 999. This would include the state of the path, the dumping of rubbish (e.g. those mattresses), fallen trees or branches. Fix My Street is another, though online, reporting option. The Rock Sign & a ‘garden’? The Rock Sign has been tagged. Rachel has organised for the Graffiti Unit to remove the vandalistic paint-job and cover the rock surface with a clear ‘paint’ that makes graffiti easier to remove. If we planted some native daisies around the sign’s boulders, would those of you who come up by car be able to bring bottles of water to help the little plants establish? It’s a very exposed position of course but it might have been native grassland there 50–60 years ago. Here's the Rock Sign again, after its installation in December, in case you've not seen the photos in one of the blog posts further below. For the first part of Rachel’s visit we were accompanied by Clare from the Fire Management Unit. Clare took photos and GPS co-ordinates of areas and rarer native species that are especially sensitive to fire damage and important to us. Her camera was busy because this HRB will affect the most extensive high-to- reasonable quality woodland zones in the reserve. 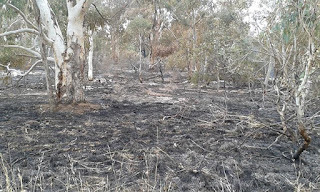 The HRB needs to be a series of cool patch-burns as there are very few places where damage to habitats and ground-dwelling species can be avoided. The ancient trees are marked for special care and the ground has been cleared around them. 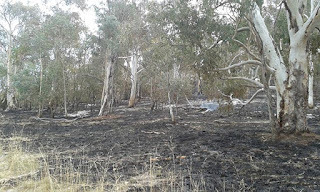 HRBs are done to “reduce fuel load” but there are differences of opinion between ecologists and fire management personnel especially surrounding the effects and frequency of burns. At least this target area hasn’t been burned officially for 40–50 years or more. There have been visible HRBs in Namadgi in the past 10 days. Residents should be notified of the pending HRB with signs going up at entrances to Mt Rogers. The Sunday 25 February working bee against the Tree of Heaven infestation was rained out as the spectacular dump of 92+ mL hit the region. 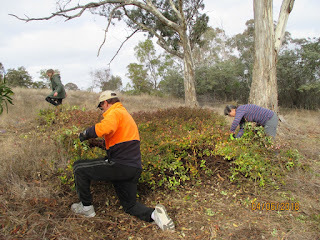 On Monday 5 March Phil and I moved through the bush east of the notice box pulling or cutting & daubing scores of young woody weeds. We ‘extrapolated’, from what we found, that there’s plenty of similar work throughout the reserve should anyone feel so motivated! As usual the weeds we found originated from berries carried into the reserve from garden plants. One stranger that I dug out turned out to be a young Asparagus Fern. The well watered ground made our work relatively easy. This last week has been quiet in most areas of the ACT as the Koels begin their migration out of the region. Red Wattlebirds, Noisy Friarbirds and Honeyeaters also move away. April is the time of traditional Honeyeater migrations through the river corridors with thousands of several species passing through to warmer places. Small groups of these migrating species may pass through Mt Rogers. One fledgling Koel won’t be migrating. Hayward found the injured chick on the edge of Mt Rogers and carefully took it home. It was after-hours. Ruth emailed a “what to do?" message but I didn’t receive it before they’d taken the little bird to the 24-hour Gungahlin Veterinary Hospital. The vet said it had ‘neurological damage’ and would need to be euthanased. As Koels are still newcomers to ‘Canberra’ I thought the Australian National Wildlife Collection would be interested in the bird as a specimen. I phoned the clinic-hospital and the staff, understanding the situation, agreed to put the corpse in their freezer. 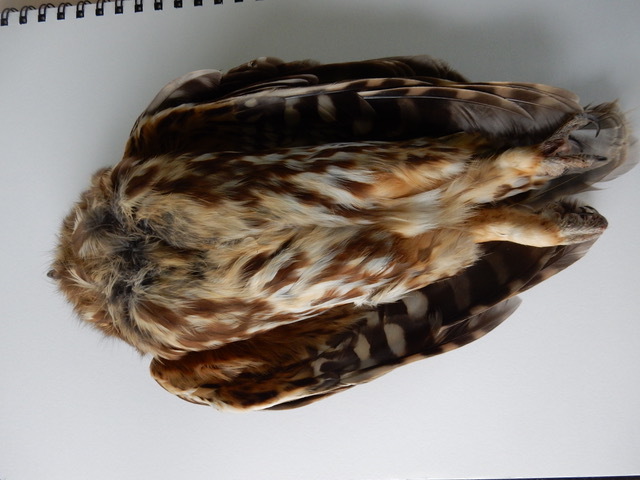 I collected the surprisingly small bird and, a few days later, took it to the ANWC at Gungahlin. The efforts of probable Wattlebird parents in raising the young cuckoo won’t be wasted as it is now in the research collection. 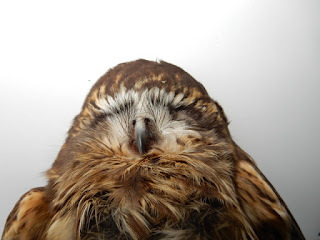 The Injured Wildlife Hotline is 0432 300 033 and Website www.actwildlife.net. Mt Rogers bird- and wildlife-watching identity, Lyndon, made news on the COG (Ornithologists’ group) email line recently. 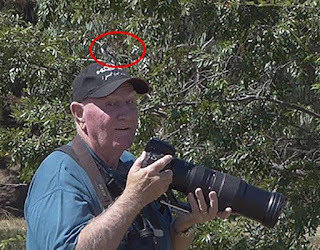 He ended up with a Red-Capped Robin on his cap whilst photographing at Yerrabi Pond, Gungahlin. Steve W was on hand with a quick photo. The robins are also seasonal migrants. The story and photo are in the blog-post below this one, and the photo is repeated here. The next working bee is on Sunday 25 March, meeting at the Wickens Place carpark at 09.00 am. We’ll try again for another assault on the Tree of Heaven. Monday 1 April’s a holiday. Copyright of text and images is owned by Rosemary Blemings, ACT. Picture Window theme. Powered by Blogger.